James English’s first half header proved the difference as Shelbourne gained a slender first leg lead over Drogheda United in the First Division Play-off. Owen Heary’s men hold the advantage ahead of Monday’s second leg at Tolka Park as they edge closer to a return to the top flight for the first time since 2013. There is still much work to do. The winner of this tie will face Finn Harps and then – in all likelihood – Limerick in two-legged affairs for a place in next season’s Premier Division. Two weeks on from sealing their play-off place in Cobh, Drogheda named an unchanged team from that clash while Heary shuffled his pack more extensively. The Shels manager made seven changes from his team’s Leinster Senior Cup triumph over St Pats last week. Drogheda were quick out of the traps in front of the biggest crowd of the season at United Park, with Jake Hyland forcing a save from Dean Delany within 30 seconds of the kick-off. Minutes later, Chris Lyons’ shot was deflected safely into the goalkeeper’s grasp. Shels began to edge their way into the game as the first half progressed, but opportunities were at a premium until David O’Sullivan went close. Lorcan Fitzgerald’s free kick was arrowed in towards English. He headed back towards the striker who was denied at point blank range by Paul Skinner. They went one better a minute later when the lead goal arrived. Fitzgerald delivered a corner from the right and English rose highest in the area to plant a header into the roof of the net. Things got worse for Drogheda minutes later when the home side were denied what appeared an obvious penalty by referee Ray Matthews. From Hyland’s knock down, Lyons lined up a shot before being hacked down by ex-Drog Derek Prendergast. The official pointed only for a corner, leading to uproarious scenes in the ground. United boss Tim Clancy, confined to the stands while serving a touchline ban, made his feelings on the matter clear for all to see. After two draws in the league earlier this year, it took Sean Brennan’s last gasp free kick to separate the sides in their third meeting of the campaign back in July. He was never presented with the opportunity to cause more despair for the visitors on the Boyne in a game of few chances on the whole. The second half was largely forgettable with neither side able to trouble the respective opposition’s goal. Sean Brennan’s free kick gave Delany something to do late on and Lyons sliced wide but that was as close as they came to an equaliser. 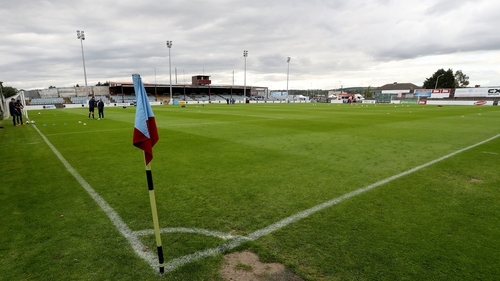 Drogheda United: Paul Skinner, Colm Deasy, Luke Gallagher, Ciaran Kelly, Conor Kane, Richie Purdy, Jake Hyland, Sean Brennan; Mark Doyle, Chris Lyons, Gareth McCaffrey (William Hondermarck, 86). Shelbourne: Dean Delany, John Ross Wilson, Derek Prendergast, Aidan Collins (Reece McEnteer,52), Lorcan Fitzgerald, Mark Hughes, Alan Byrne, Shane Farrell (Adam Evans, 75), James English (Gavin Boyne, 90+4), Karl Moore, David O’Sullivan.